This year's NRF Big Show illustrated how far we've come with RFID in Retail and some exciting developments in IoT. Retail is the killer app for RAIN/UHF RFID, offering very compelling ROI for certain use cases (e.g. inventory management of high mix complexity categories). Retail has seen a lot of investment in RFID technologies and the solutions have become very mature, reliable, and usable. This maturity, as well as fresh new technology and use cases, were on display at the National Retail Federation show in NYC this year. Checkpoint had some great demos, including one for grocers’ meat departments to ensure greater freshness and reduced spoilage (a multi-billion-dollar problem for US grocers). In a pilot with one of Checkpoint’s customers, the grocer put an RFID tag on each package of fresh meat, which helped to ensure the right mix of product was on display, reduced labor and sped up replenishment of new product and removal of expired product, allowed product nearing expiration to be properly marked down in a timely manner to reduce the amount of spoilage and increase profits and sales. Management of freshness in meat and other expensive perishable items is one of the few uses in grocery where RFID makes economic sense today. Checkpoint also displayed their tagging of cosmetics using their new Micro tag, and their previously released tiny (12mm X 12mm) Whisper and long narrow Slim tags. The transparency and small size of these tags makes them a great fit for cosmetics. Cosmetics has been a category that has been notoriously difficult to read. In the past, retailers have told me that even though they really want to tag their cosmetics, ‘the technology is not ready’. Well it seems that statement is less true each year. I did a very informal test at the Checkpoint booth this year. They had 15 lipsticks on display and I jammed them all together so they were touching one another on all sides. The reader was able to read them no problem, almost instantly. This readability in such a small form factor was made possible by the relentless improvements to chip sensitivity from chip vendors like Impinj and NXP, who make the chips for these tags. Finally, at Checkpoint’s booth was a mobile application for store associates to automate fulfillment for omni-channel orders. This is the killer app with the big ROI, and Checkpoint has a strong software foundation to support this use case. Impinj, along with ShopWithMe announced a number of innovations using Impinj’s RAIN (UHF) RFID readers and software for use in ShopWithMe’s pop-up stores, including a “Pixel Wall” that displays information about an item when a shopper comes near it, wayfinding to show shoppers how to find specific products in the store, a smart fitting room that displays information about the products the shopper brings in (and suggests accessories or matching items to go with it), and super-fast self-checkout which instantly reads all the items and lets the shopper pay with their ShopWithMe mobile app or a credit card. 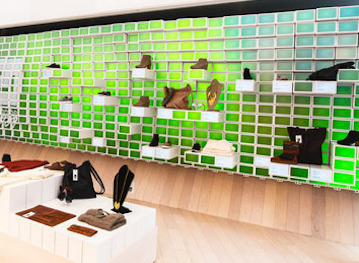 Among other things, Impinj hosted a tour of Denimwall’s G-Star RAW store in Union square, outfitted with Impinj’s overhead xArray readers, using Detego’s software for item-visibility and real-time analytics. Denimwall is one of the first retailers to implement continuous RFID readers across their whole chain (six stores). This should make a great case study for other retailers to observe and see how well this continuous reading approach works and what benefits it brings, especially those benefits and uses that are not achievable with the manual, intermittent handheld approach to RFID. 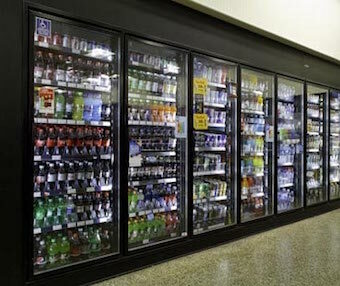 Zebra Technologies demonstrated its reference design for light and temperature sensing within a grocery refrigerator. Retailers need to prove to suppliers that product has been kept at the proper temperature. Today that is done by the retailer sending their store associates to manually monitor and record the temperature at all the fridges every hour or so. The smart fridge that Zebra showed allows the temperature to be monitored continuously and automatically. An alarm is sent if the door is left open or if the temperature exceeds set thresholds. The reference design uses an ARM processor and Atmel’s low power mesh network. The mesh network allows multiple fridges to connect to each other and share a single connection to the backbone network (e.g. via WiFi, wired LAN, or cellular) thereby lowering the cost per unit. The smart fridge application was built on Zebra’s Zatar IoT cloud platform. Tyco’s TrueVue software platform was designed to support the Integrated Store concept, where information from multiple systems, sensors, and video is merged to provide a more complete picture of what is happening in the store. Related to that vision, Tyco recently announced plans to acquire ShopperTrak, provider of traffic intelligence and in-store retail analytics. ShopperTrak was ranked as tied for first in ABI’s assessment of this category last year. Tyco plans to use TrueVue to bring together the RFID data about items with ShopperTrak’s data about the shoppers to create a higher level of intelligence. This will enable all kinds of interesting analytics around things like conversion rates; and ‘path of purchase’ (the path each shopper takes, how long they dwell at different locations, what items they look at, and ultimately what they buy). It can also provide queue analytics to alert that lines are too long … or better yet an alert before the lines get too long. There will be video analytics around the customer (age, gender, etc. ), and LP—detecting suspicious behavior (like someone just did a sweep taking everything off a shelf), reading license plates in the parking lot, and more. In another multi-use example, German retailer Gerry Weber is using Tyco’s RFID for both EAS and inventory management, rolling it out across 800 of their stores using Tyco’s TrueVue platform chain-wide. They are using it for receiving, cycle counting, on floor replenishment, and EAS. Tyco also showed how several name brand high-end athletic shoe manufacturers are using RFID embedded in the soles of the shoes to do Track and Trace, primarily to reduce diversion/grey market activities, but also to reduce theft. The track and trace is done at three points in the supply chain. First is in the factory. Shoe factories are often in developing countries without sophisticated infrastructure. For that reason, Tyco designed a simple ‘plug and play’ system using just a handheld RFID reader and WiFi connected directly to the cloud. The manufacturer’s QA personnel scans a barcode on the shoe or box and the system double-checks that it matches the EPC embedded in the shoe. This ensures that the correct EPC number is on the product. That information goes up to the cloud. The shoes are then packed and transported to the DC (which could be the manufacturer’s or retailer’s DC) where they pass through an RFID tunnel reader and again the information is sent up to the cloud. This provides item-level visibility at each DC for the manufacturer—they know exactly which shoe went to which DC. From there the shoes are delivered to the retail stores, or used to fulfill ecommerce orders. Brand inspectors, working on behalf of the manufacturer, use their iPhone equipped with a Bluetooth-connected RFID reader, to inspect items at the physical stores, as well as items they’ve ordered over the internet.1 Manufacturers are thereby able to see if any shoes are being sold at places and prices that are not authorized. It was heartening to see these and other applications of RFID at NRF this year. We have indeed come a long way. 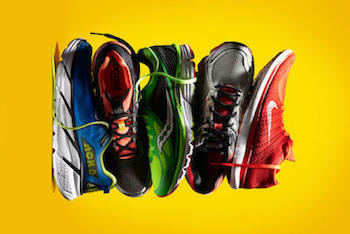 1 The largest portion of diversion for shoes happens online.